Superior flexibility 100% PVC injection molded. Reflective sleeve for day-night high visibility High flexibility to avoid crushing Space for writing some message or logo Provision for fixing of plastic chains, light bar, reflector, message plate rope, road lamp and cone bar. 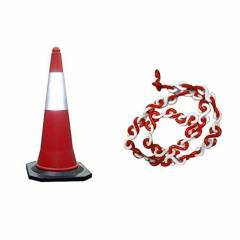 Bellstone PVC Traffic Safety Cone with 10m Chain, 528631 (Pack of 10) is a premium quality Traffic Cones from Bellstone. Moglix is a well-known ecommerce platform for qualitative range of Traffic Cones. All Bellstone PVC Traffic Safety Cone with 10m Chain, 528631 (Pack of 10) are manufactured by using quality assured material and advanced techniques, which make them up to the standard in this highly challenging field. The materials utilized to manufacture Bellstone PVC Traffic Safety Cone with 10m Chain, 528631 (Pack of 10), are sourced from the most reliable and official Traffic Cones vendors, chosen after performing detailed market surveys. Thus, Bellstone products are widely acknowledged in the market for their high quality. We are dedicatedly involved in providing an excellent quality array of Bellstone Traffic Cones.